A superb back-nine surge inspired Lucas Glover to claim the two-day PGA Grand Slam of Golf in Bermuda. The US Open champion carded a five-under 66 to finish five shots ahead of Masters champion Angel Cabrera. Glover saw his overnight two-shot lead eroded as Open champion Stewart Cink holed four birdies on his front nine. But Cink dropped shots on the 12th and 13th before a double bogey on the 15th as Glover birdied four of his last nine holes to storm to victory. Cink finished six shots adrift of Glover while USPGA champion Yang Yong-Eun was a further four shots behind after a final-round 70. Glover, who registered a Port Royal Golf Club course record of 65 on Tuesday, collected $600,000 (£361,514) for his efforts. "I got it turned around towards the end of the front nine and played pretty good golf from there," said the 29-year-old from South Carolina. "This is such a hard tournament to get into and I would be crazy if I said on 1 January that my goal is to win the grand slam because you only have four chances to get here. "All four of us came here wanting to win the grand slam. I'm very honoured and very happy that it was me." World number 13 Cink admitted his poor back-nine performance cost him victory. "I had some momentum going and in a tournament like this where it's two rounds, you really need to stay on the gas the whole day, the whole two rounds," said the 36-year-old. "I made a couple (of) bogeys in a row out there and I felt like my momentum was gone. Lucas played really well during that stretch." 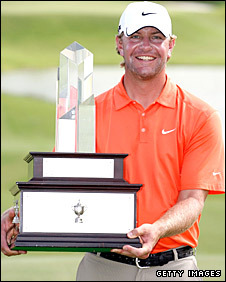 Glover's victory was also the largest winning margin since Tiger Woods beat Phil Mickelson by seven strokes in 2005.